Railpictures.ca - Dave Beach Photo: VIA used the higher speed Turbos for a few trains a day between Montreal and Toronto in 1978. Here we see a westbound almost at the end of it’s trip near the Rouge River crossing west of Pickering. It was a fun ride to snag a seat in the bubble and watch the speedometer push toward 100 mph for the just over 4 hour trip. | Railpictures.ca – Canadian Railway Photography – photographie ferroviaire Canadienne. 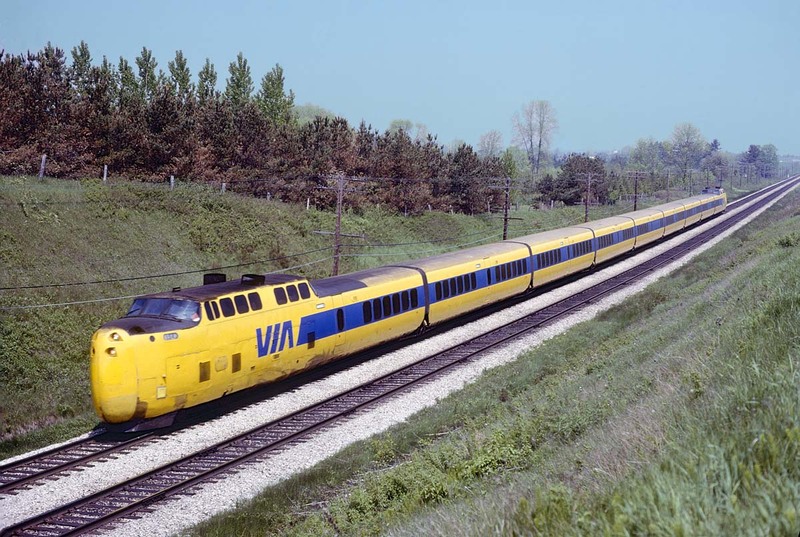 Caption: VIA used the higher speed Turbos for a few trains a day between Montreal and Toronto in 1978. Here we see a westbound almost at the end of it's trip near the Rouge River crossing west of Pickering. It was a fun ride to snag a seat in the bubble and watch the speedometer push toward 100 mph for the just over 4 hour trip. Amazing they achieved those speeds on joint rail. Along with 100 mph, also meant to bring notice to the jointed rail. Boy! This one tops my weekend of viewing rail photos. Thanks for posting this Turbo picture.